Coming up Thursday, April 18 through Sunday the 21st is our first Massive sale of 2019!! 20-50% off all apparel - BOGO 50% off on Hippy Tree and Roark Apparel - 15-20% off all wetsuits - 15% off Skate - 20% off all Accessories - 20% off Shoes - 15% Sunglasses - $100 gift card with M21 or Borst Surfboard purchase - Buy 3 get 1 free Stance Socks - Plus much more!! Everything on SALE!!! Thank you to everyone that has been coming to the Yoga for Surfers classes. We will be starting our next 10 week block of yoga classes starting Wednesday, April 24t at 7:30pm. As always the classes are free and awesome. Call the shop for more information, 805-541-1129. Friday night, March 15th at 7:30 pm we will be premiering STAB’s “STAB IN THE DARK” featuring Mick Fanning. This event is free to the public!! We will have beverages, a keg, giveaways from REEF, Rip Curl and others and good times are guaranteed for all!!! This is an all ages event, Families, Rippers, Pros, Legends, Average Joes, everyone is welcome for another EPIC event at Central Coast Surfboards! Call the shop if you want to be involved or have any questions. Yeeeeeew! 6 - 7 PM - SOCIAL MEDIA CONTEST STARTS, PHOTOS ON THE RAMP, MOST LIKES THAT EVENING GETS A PRIZE. SKATING IS GOING DOWN. 8 - 9PM - VERT SK8 THERAPY FOR BEGINNERS OR THOSE THAT HAVE NOT SKATED A VERT RAMP BEFORE. On Friday, September 28th Central Coast Surfboards and Quiksilver will be presenting GENERATIONS The Movie. Event kicks off at 7:00pm at the shop, this event is free and great for all ages. We will have giveaways, a surfboard raffle, a keg from LIBERTINE Brewing Company, and guaranteed good times. It’s not just a movie, it’s a party with a movie!! We will see you there. Yewwwww! 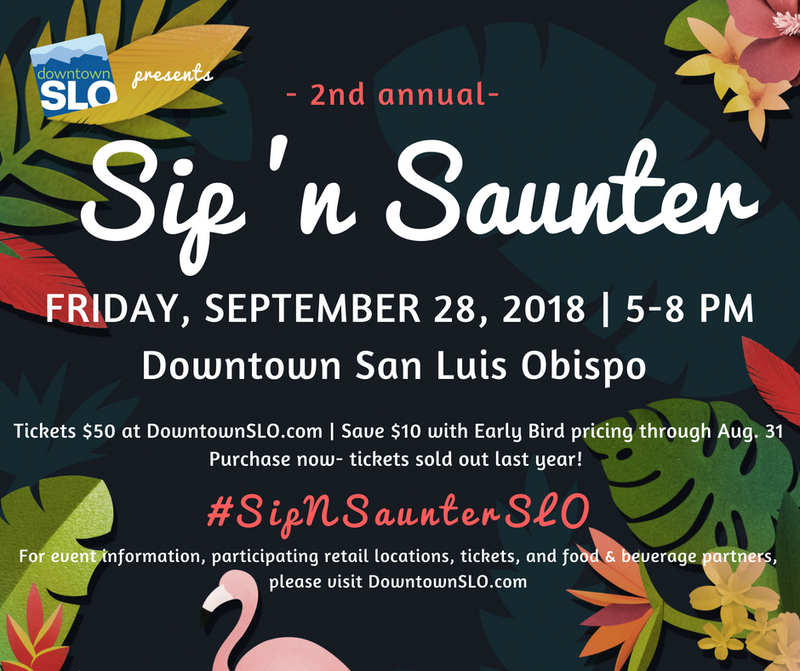 Central Coast Surfboards will be hosting with 7 Sister Brewing,Ultima Tulie Wines and Central Coast Meats for the 2nd annual Sip 'n Saunter event. Tickets go on sale Wednesday, August 15 at 9 AM! This event will take place on Friday, September 28 from 5-8 PM at multiple Downtown venues. Click here to learn more and buy tickets. Starting up again on September 26th. Stay tuned for more details, follow us on Instagram @ccsurf.